Take a peek inside any office near the coast on a midweek afternoon and you might just see a salty-looking type or two furtively logging on to weather websites or talking conspiratorially on the phone. Chances are they’re looking forward to the midweek race. Most clubs around the country run low-key cruiser racing one evening in the week and at weekends. My local club, Hamble River SC, runs racing for cruisers starting at 1830 on Wednesday evenings from April to September. It’s a great opportunity for a midweek stress-buster, and a chance to spend the evening with like-minded people in a fun environment. Even if you have absolutely no interest in haring around the cans, the tips in this feature can help you get to your destination quicker and be in the pub before closing time. Racing at this end of the scale isn’t expensive or elitist, but it might just give your sailing – and boat owning – another dimension. Not convinced? We asked some PBO readers from around the UK why they do it. First, find a club that does the type of racing you’d like to do. Best of all, walk into the bar on a race night and get chatting to the sailors in there. You’ll probably find that by the time you go home you’ll have found a boat to sail on, been bought a drink or had some crew found for you by an enthusiastic commodore. The next step is to buy a rule book, or look on one of the many racing rules websites to ensure you have a good grasp of the rules before you get on the water. To the uninitiated, the start line can be a daunting place, with numerous boats jostling for position in a confined area. However, with a firm knowledge of the rules and a deft hand on the tiller, you should be able to stay safe and get a good start. A good trick is to have one of your crew constantly estimating the time it’ll take you to get to the line. If you have enough time, it’s worth making a practice run to get a feel of time-on-distance and how far you’ll travel in a set period. Have another of the crew reading out the time to go to the start so you can compare the two. But the most important thing is to get clear air. It can pay to start just clear of the bundle of boats at the favoured end of the line in your own breeze, so you can sail your own race. If you’re over the line, don’t worry: it’s not the end of the world. In fact, most sailors are over-conservative on a start line. My dad used to buy me a Mars bar whenever I was over the line in my Optimist to encourage me to get better starts! Get to know the procedure for announcing boats over the line – it varies. Some clubs announce the sail numbers over the VHF, while others just display an ‘X’ flag. 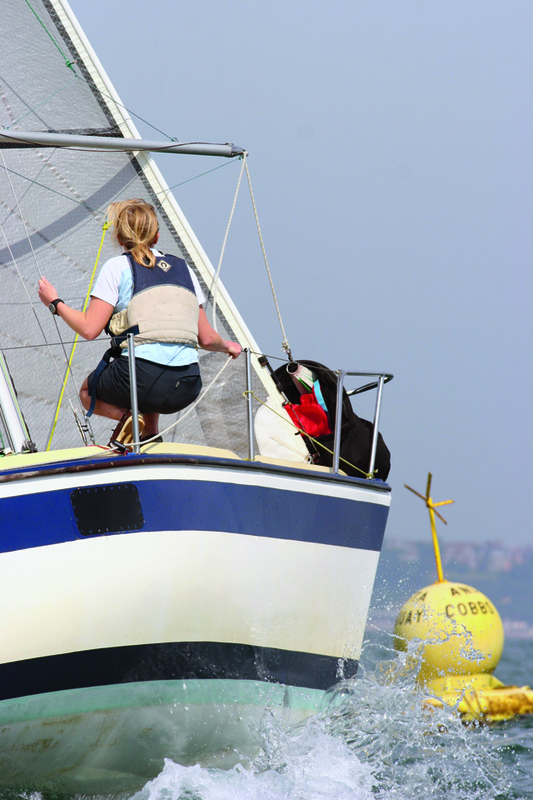 Even on a balmy summer evening, the aim is still to get round the course faster than anyone else, so it’s worth following a few pointers to get your boat moving as quickly as she can through the water. First of all, there’s no point dragging fronds of weed around the course, so keeping the bottom clean is vital. A long-handled brush, or some variation on the theme, wielded fortnightly, is usually enough to keep the worst of the weed off the boat’s bottom. If racing regularly, it can pay to drain your water tanks and take off some of the cruising debris that can accumulate: after all, weight is only useful in a steamroller. By and large, there’s no difference between sail trim when cruising and when racing, but you may have more sail up when racing with a full crew than you would when cruising in the same wind strength. The following tips apply equally to cruising boats – who wants to spend any longer beating than is absolutely necessary? 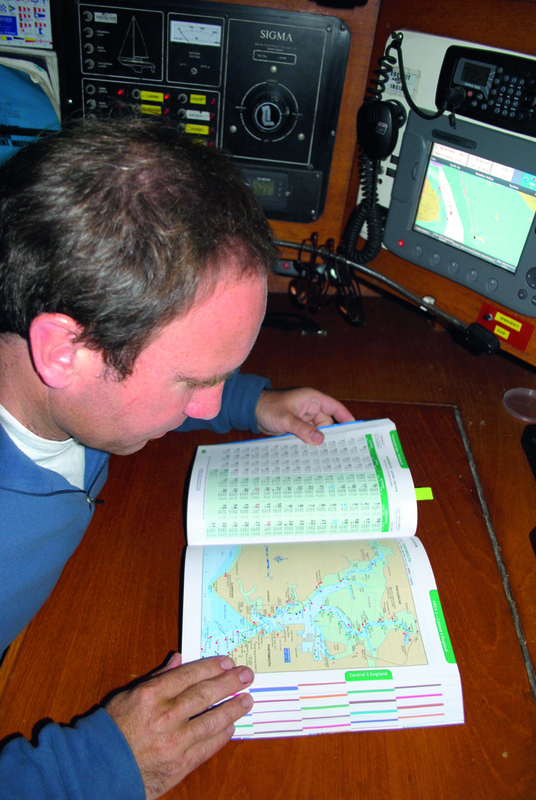 Get someone to watch the compass to track your heading and therefore the windshifts, which can make the difference between being first and last at the windward mark. The helmsman’s job is to just watch the telltales – if that’s you, nominate a crewmember to be ‘crew boss’ and organise the rest of the crew while you concentrate on speed. Remember, your time is being taken, and every second counts! Generally, it pays to put the muscles on the headsail trim – it’s a tough job. Make sure they understand what they’re looking for. Put some marks on each spreader end with insulation tape to give the trimmer a guide to how he should trim the sail for speed. Increasing the halyard tension will flatten the sail and move its centre of effort forward – the deepest part of the aerofoil shape should ideally be at 35-45% of the way back from the luff to the leech. It also helps to put numbers on your jib car tracks so you can record the car positions in different wind strengths. The car should be adjusted so that both sets of tell-tales lift at the same time. If you have a furling genoa, it’s much faster upwind to use a working jib on an inner forestay than to try to reef the furling sail. Change down when you first think of it – it’s better for the sail and stops you being overpressed. If you can, rig a snatchblock on the toerail to act as a reaching sheet. Round the cans races in confined waters often have lengthy reaching legs, and being able to take the sheet lead further outboard and forward will make a huge difference on a reach, making the sail shape much more efficient. Trimming the main can be seen as a bit of a black art, but it’s important to put a good person on it. When sailing in close proximity to other boats, it’s important that, if necessary, you can bear away in a hurry. In anything over a light breeze, the helm won’t be able to bear away unless the main is eased: many boats have T-boned another while trying to bear away behind them, so your mainsheet trimmer needs to be poised to dump the mainsheet when approaching other boats on port tack. Upwind, the sail wants to be relatively flat, which means pulling on the main halyard or Cunningham, outhaul and kicker. 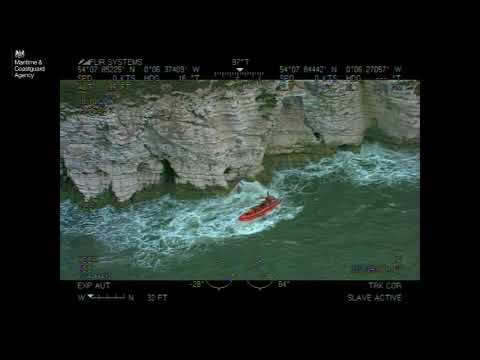 The boom should be near the boat’s centreline unless overpressed. Fit a set of leech telltales. The top one should be curled round the back of the sail 50% of the time. More than that, and the sheet can be eased, and vice versa. In very light winds, you’re looking for twist in the sail – the traveller can come to windward and the sheet eased so the boom is on the centreline. In heavy winds, you can play the traveller and the sheet. You’ll need enough kicker applied, so the boom goes sideways when eased, not upwards. Don’t get pressured into using a spinnaker – if your crew isn’t up to it, don’t push your luck, and practise when you’re not in a racing environment. By and large, sailing dead downwind can be dangerous and is slow. It’s usually faster to sail a few degrees higher: you may sail a little further, but your increased speed will more than compensate for that. Before bearing away round the windward mark, make sure someone has worked out which way you’ll be rounding the leeward mark, which gybe you need to be on, which side the jib needs to be, and talk your crew through every step of the hoists and drops, thereby avoiding dangerous last-minute calls and course alterations. It’s worth practicing gybing with the spinnaker up whenever you can. Even top crews have to remind themselves how to do it frequently. If it’s windy and you’re not confident, don’t do it – drop if you need to. Don’t carry the kite right up to the mark unless you know that your crew can handle dropping it and the required manoeuvre. Far better to drop early, get tidied up and make a clean rounding than end up downwind of the buoy with a spinnaker acting like a dragsail. Different clubs use different handicapping systems. 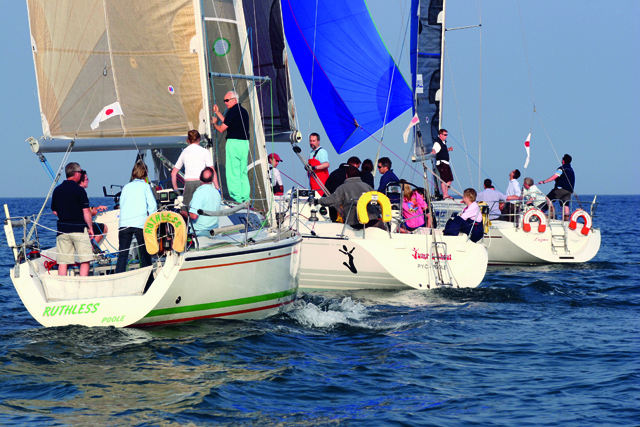 Some top racing clubs use IRC, which needs a certificate issued by the Royal Ocean Racing Club (RORC). Others often use either their own or the relatively new RYA NHC (National Handicap for Cruisers) system. Many adjust the ratings over time to match the boat’s abilities. If you find yourself winning a lot in one of these clubs, prepare to see your rating increased to make you work harder! 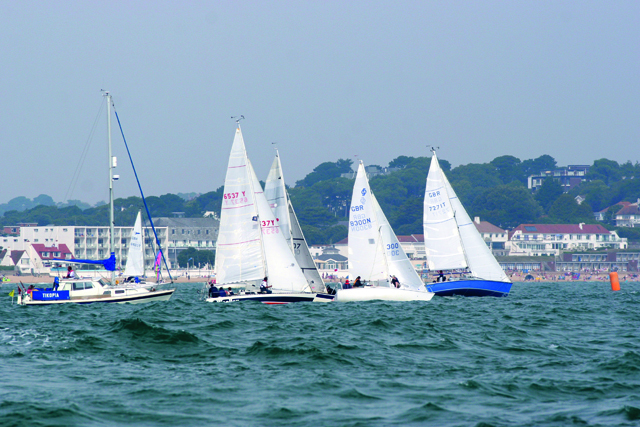 Some clubs run a weekly pursuit race, where each boat is given its own start time. The aim is then to finish first on the water. Pursuit races can be great fun, and it’s much easier than in a timed handicap race to see how you’re doing. Having a regular crew is a great bonus – you’ll all learn together and become a well-oiled team. Your nominated ‘crew boss’ should be able to keep everyone briefed as to what’s going on. Put simply, there are four aspects to tactics: Tide tactics, wind tactics, boat-on-fleet tactics and boat-on-boat tactics. This is the order in which you should consider them in a highly tidal area. Check the wind forecast and the tidal charts so that you know the best way to go. Only then can you begin to look out of the boat and see what the fleet is doing. If you’re ahead, try and stay between the mark and the fleet behind. The main thing, especially in handicap racing, is to sail your own race and not get too distracted by what others are doing. Racing at this end of the scale shouldn’t cost you any more than a bit more on your insurance premium. 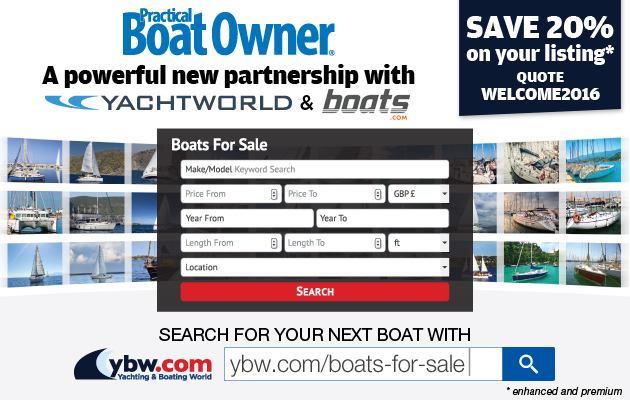 There’s no need to rush out and buy a new suit of sails or a new set of ball-bearing blocks and Dyneema sheets.